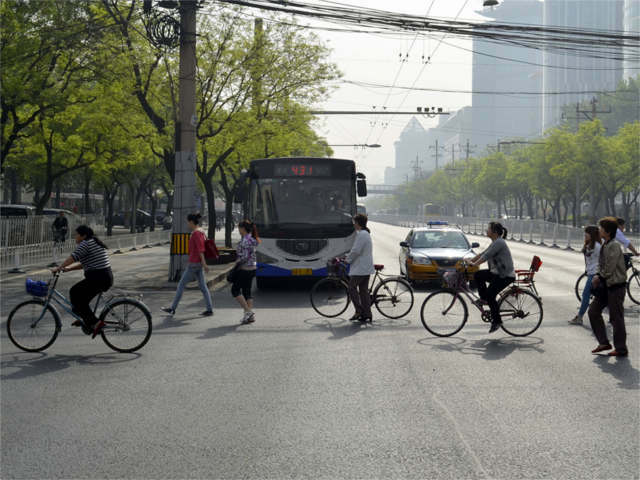 The authors of Low-Carbon Land Transport – Policy Handbook ask, “Which transport vision will cities like Beijing, China [pictured here], choose for their future?” Photo by Daniel Bongardt. In 2050, Pankaj and Amisha may live in the same country, but their daily experience in traffic could not be more different. Being troubled by congestion, air pollution, noise, and an insufficient public transport system is the daily life of Pankaj, an IT-consultant from Mumbai. The fact that the challenge to avoid rush hour extends his working hours and thus, has a negative impact on his social life and physical activities, causes frustration. On the other hand, Amisha, a doctor from Hyderabad, is able to bike to work, due to the short distances between her home and the hospital where she works. Cycling on safe and broad cycle paths or being able to transfer to the bus rapid transit system (BRT) is highly convenient. Amisha’s two children both walk to school, which is located only a few blocks away. This is the starting point for a book recently published by Routledge, entitled Low-Carbon Land Transport – Policy Handbook. The authors focus on the second scenario and discuss how Amisha’s story could become a reality. The book begins by outlining drivers of increased motorization and greenhouse gas emissions (GHG), such as technology, economic development, demographics, culture, and spatial development; it then provides a comprehensive overview of the tools needed to realize this vision and reducing the emissions. The first part is a comprehensive overview of national and local strategies that have proven to be effective. The selection is based on the idea that policies and measures to promote low-carbon transport systems can be realized by identifying a combination of strategies, such as avoiding unnecessary travel; shifting towards a higher share of low-carbon modes, such as public transport and rail-based freight; and improving the efficiency of vehicles and the promotion of low-carbon fuels. On the local level, cities can focus on implementing high-quality cycling and walking infrastructure; transit-oriented urban development; and green mobility management. These strategies will promote sustainable transport, of which climate change mitigation is one benefit. Policies and measures are discussed not only in regard to their impacts, but also in consideration of barriers and success factors. The second part of the toolbox focuses on measuring emissions and their reduction. In order to track progress and identify the most effective strategies, there is a need to quantify carbon emissions and account policies in future scenarios. Especially in developing countries, low-quality data is a bottleneck in the process of utilizing more advanced emission estimation methodologies. As data gathering can be a costly undertaking, an optimal balance needs to be found between costs and accuracy of outcomes. Reliable data is also benefits transport planning and other public policy goals, such as road safety and air quality improvement. Taking up the Activity-Share-Intensity-Fuel framework (ASIF), in which the total emissions are the product of activity (A), mode share (S), energy intensity (I) and fuel mix (F), the book provides an overview on several emissions inventory models, such as the German-Austrian-Swiss Handbook of Emission Factors for Road Transport (HBEFA); the Motor Vehicle Emission Simulator (MOVES); and the International Vehicle Emissions Model (IVE), in addition to scenario tools like the TREMOVE policy assessment model and the Long Range Energy Alternatives Planning system (LEAP). High-quality implementation and constant evaluation of the quality and success (Excellence). 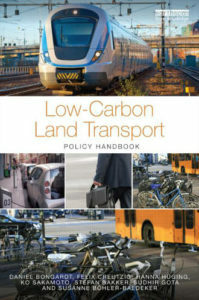 Considering that transport already accounts for 15 percent of global greenhouse gas emissions, and this share is increasing, the authors of Low Carbon Land Transport – Policy Handbook argue that we are reaching a crossroads: Pankaj and Amisha represent two different ways of life that are consequences of decisions taken today. Pankaj lives in a world where the global fleet of vehicles increases to 2–3 billion. GHG emissions continue to rise, and the world has already experienced a rise in global temperature of 4 to 5 degrees. On the other hand is Amisha’s world – a scenario in which all dimensions of sustainable mobility are enhanced. Here, the global fleet of cars is kept to around 1 billion — including a large proportion of lightweight and electric, plug-in hybrid or alternative fuel engines — and air quality is improved tremendously. Global warming is kept in balance, and public health improves due to active transport. And ultimately, cities become more attractive through a vibrant street life, made possible by a lower traffic volume, due to the proximity of the workplace and home. Taking this into consideration, the book is written for today’s decision-makers who care for future generations and low carbon development. Daniel Bongardt is project director at GIZ – the German International Corporation – and is responsible for urban transport and climate change in China. Since 2009, he has developed GIZ’s transport and climate change agenda. Before that, he worked at the Wuppertal Institute for Climate, Environment and Energy, a think tank on sustainable development. Insa Eekhoff is a Sustainable Transport and Climate Change specialist for China at the German International Cooperation (GIZ). Felix Creutzig is senior research fellow and group leader in the Economics of Climate Change department at the Technical University of Berlin (Germany). Felix is lead author of the upcoming IPCC Assessment Report on transportation and obtained his PhD in Computational Neuroscience at the Humboldt-Universität of Berlin after graduating in Theoretical Physics from the University of Cambridge. Hanna Hüging is Research Fellow at the Wuppertal Institute for Climate, Environment and Energy (Germany). Her research focus is on energy-efficient and low-carbon transport strategies. She holds an MSc in Environmental Science from the University of Cologne. Ko Sakamoto is a transport economist at the Asian Development Bank (ADB). Prior to joining ADB, he worked at the UK Transport Research Laboratory (TRL), focusing on international climate change and sustainable transport policy. He holds an MA in Transport Economics from the University of Leeds. Stefan Bakker has been a climate policy researcher at the Energy Research Centre of the Netherlands in the area of climate change. He pursues a PhD on the topic of low-carbon development in the transport sector with the University of Twente, the Netherlands. Since October 2012, he implements the ASEAN-German project on Energy Efficiency in the Transport Sector on behalf of GIZ. Sudhir Gota works as a technical manager in the Clean Air Initiative for Asian Cities (CAI-Asia) Centre in Manila. He specializes in environmental issues related to transport and holds a Masters Degree in Transportation Engineering from the National Institute of Technology, Warangal. Susanne Böhler-Baedeker is urban planning engineer and co-director of the research group ‘Energy, Transport and Climate Policy’ at the Wuppertal Institute for Climate, Environment and Energy. For her PhD thesis at the University of Dortmund she analyzed the acceptance of different mobility services for individual mobility.